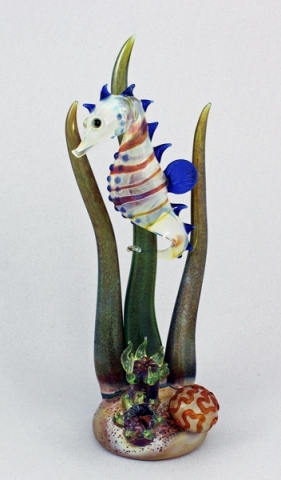 Lampworked Seahorse Sculpture by Jeremy Sinkus. Size is approximately 8" high x 3 1/2" long x 3" wide. Each piece is individually handmade and may vary slightly in size, shape or color. The artist does his best to reproduce each design as close to the photo as possible. However, we want you to know that because they are each unique creations in themselves, your piece might look slightly different.